It’s about time I got my hands on this book. I’m really late, I know. Though the library’s hardcover copy was gnarled and stained, I still had patience and flew through this book. My reaction: WOW! 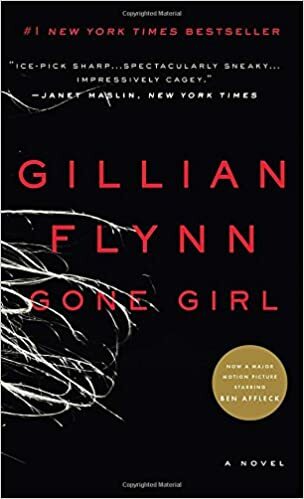 I’m sure you’ve already read “Gone Girl” but here is a little summary: Nick and Amy Dunne seem to have the perfect life. They’re (seemingly) happily married, but when Amy goes missing, their small town turns to Nick for answers, who seems to be in the same boat as everyone else. Lies and deceit make this harrowing story by Gillian Flynn hair-raising. The story seemed to be typical at first; spouse goes missing, blame other spouse, turns out he/she killed the other spouse they’re arrested. But as the story progresses, the lies told by both Amy and Nick complicate the plot. It is written from the alternating perspectives of Amy and Nick. Amy’s perspective is shown through her personal diary, which later becomes a part of the plot. Through these first-person perspectives, you can see the similarities and differences in their thoughts. Since this story is about a relationship gone haywire, you can see through their thoughts why they thought they were good for each other at first but not later. It’s a very personal telling of their inner feelings. Especially for Amy, as she writes down everything she is feeling. Nick’s perspective is told on the present. He is in the time when Amy first goes missing and it carries from there. Sometimes the things Amy and Nick think are downright psycho. And that’s what makes this book so intriguing. Amy and Nick’s characters are extremely well-developed, due to this first-person perspective. It is truly unbelievable how the thoughts of psychopaths can seem so real, almost relatable (not saying I’m a psycho, OK). Flynn creates characters that actually contribute to the story and plot in their own way. It’s remarkable how each and every character is so important to the story. This book was just the right length. I wasn’t left missing information nor was the book stretched out. Overall, I thoroughly enjoyed this book and highly recommend it! I actually had to read this novel for school. And surprisingly, for once, it was pretty good. 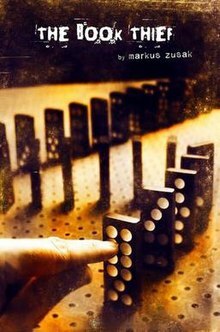 This international bestseller by Markus Zusak won many awards for its complicated story and wonderful characters. Liesel Meminger is the main character in the book, and her story is told through the perspective of “Death” in Germany during the 30’s and the Second World War. She is a young German girl who is fostered by two poor parents and as the story goes on, Liesel grows into a teenage girl. Along the way, she develops family relationships, makes friends, learns valuable lessons, and creates her own values, all while the horrors of Hitler’s rise and the war occur. It’s a coming-of-age novel that will strike a chord with readers. Let me start by saying that this book is bursting with literary devices. The entire book is quite literally one giant metaphor, as “Death” tells the story. Every page has a metaphor somewhere, used in some way. You could be talking about socks and there would still be some deep metaphor made by the author. This is really great for analyzing and interpreting the multiple meanings. When I was discussing this book in a seminar, we all interpreted the book differently, and our answers were all reasonable. The descriptions are so detailed and the language used is not complicated and not too easy, which I like in a book. The fact that Death tells the story, I found, was very interesting. It created a lot of literary devices and all, but it was also interesting to see how Zusak used Death to illustrate its role in the war. He talks about how “busy” Death becomes in the war and how demanding Hitler is of Death. I think it’s quite clever, and it was enjoyable to read these parts. The thing I didn’t like about the book is that it is so unnecessarily long. There are countless parts in the book where I could not find a single explanation as to what it adds to the book. Trust me when I say I genuinely tried to find its relevance to the book; I was being graded on my analysis. Not only were these parts useless, but they were just plain boring! Some characters have no real purpose in the book. In fact, they just take away from the story. This book would be so much better if it was less than 584 pages. Overall, this book was pretty enjoyable. I would recommend this to freshmen, not sophomores (as I was when I read this book). Thanks for reading!